On Thursday the 20th of April 2017 at Umbrella Studio Contemporary Arts Townsville (Australia), Jolyon Drury delivered an evening lecture relating to his father Paul Drury and the artists he befriended and worked with during his life. In spite of the presentation night being a week night, more than forty people from the Townsville arts community were in attendance. He spoke about Paul Drury’s time at Goldsmiths College and the strong and long lasting friendships which arose between artists such as Edward Bouvery-Hoyton, Graham Sutherland, William larkins and Alexander Walker. Jolyon showed rare examples of Drury’s preliminary drawings which due to circumstances were never developed into editioned etchings (Barn Interior Graphite drawing 1923) or important studies made prior to the making of etchings such as those for September, 1928. Information about of Paul’s, father the great British sculptor Alfred Drury was also shared during the lecture. Jolyon discussed Alfred’s friendship with Paul’s circle of friends as well the undocumented assistance Paul gave to Alfred in regard to the construction of some of his major commissions. Such commitments of time and energy may have greatly impacted on the personal work Paul Drury may have produced during those extended periods. The lecture was packed with gems of information that gave us an informative and rare personal insight into the life of an often underrated, but significant 20th Century artist. After the lecture ended guests were invited talk with Jolyon individually as well as to view a number of original etchings (from a local private collection) by Paul Drury and other artists with whom he was associated. A book relating to the lecture and written by Jolyon Drury was also available for purchase for those wanting to know more about this important period of British printmaking. 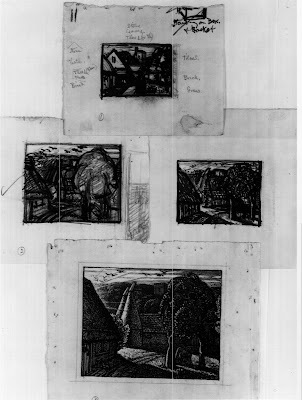 Revelation to Revolution: The Legacy of Samuel Palmer, The revival and evolution of pastoral printmaking by Paul Drury and the Goldsmith’s School of the 20th Century. Paul Drury, unpublished etching, "A Distant View of Reculver" 1932.